Well, it was Glenn. Not just that, it was the most brutal, heartbreaking death of the entire series. It mentally destroyed many fans to see their beloved Glenn die like he did, looking like one of those squishy monster heads at Walmart that bulge their eyes when you squeeze them. A lot of people never watched another episode, which is understandable. But now, over a year later, many fans are still using their platforms on popular geek blogs to try and drive fans away from the show. 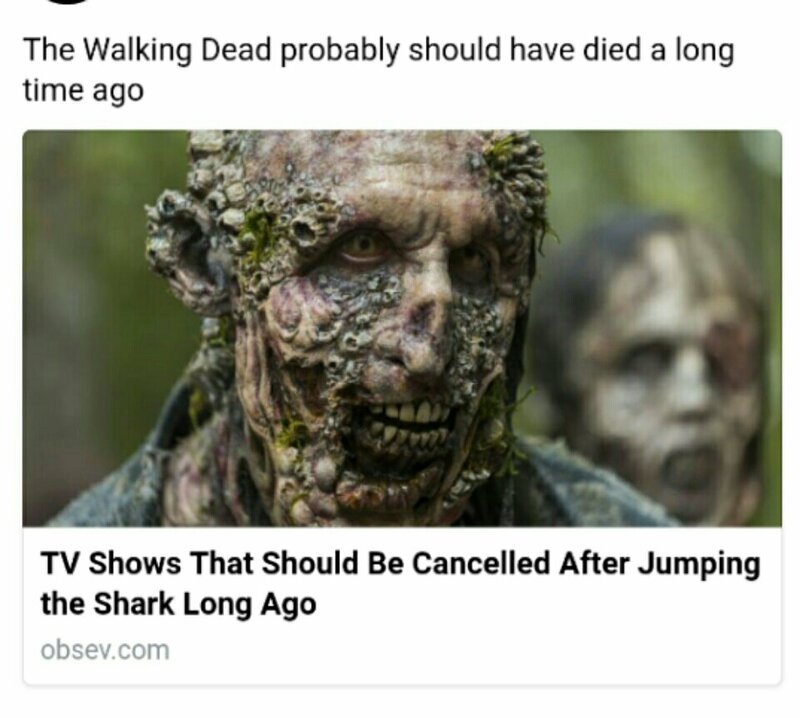 Over a year later, toxic fans from Comic Book Resources and Obsev Entertainment are still trying their very best to convince their audience that TWD should be cancelled. This is nothing less than a toxic fan base’s childish attempt to ruin a show for everyone just because they didn’t like something. It’s not enough to stop watching, they are still trying desperately to convince other people to stop watching. It’s “Stop liking what I don’t like!” at it’s very worst. It must be conceded that TWD has had a ratings slump. Media news sites have described the midseason final ratings as “shockingly low.” What they mean is “Shockingly low” for The Walking Dead. Last season (after the death of Glenn, by the way), The Walking Dead was pulling in ratings of 17 million. Those are NFL numbers. Season eight started with 11 million viewers, but that number dropped to about seven million for the midseason final. For comparison, WWE Monday Night Raw typically brings in between 2.5 and 3 million. This is still no insignificant loss in ratings, however, and there are several explanations for this. The biggest reason is probably because of character deaths, especially Glenn. Leaving aside the vindictive fans who are actively trying to get the show cancelled, it really can’t be helped that many fans had no reason to keep watching anymore. Glenn was their guy, their audience surrogate through the series. If the main guy they were all pulling for died, and most of the other characters they liked are already dead, why would they care what happens next? For some, the answer to that question was Negan. As much as fans hate him, he’s probably the most interesting an energetic villain this show has ever had. But a villain is meant to be hated, and The Walking Dead might have done that job a little too well. As much as some like him, others view Negan as pure cancer because of the cruelty he’s inflicted on the characters they love. The only possible reason these fans would want to keep watching is to watch Negan get what he deserves, and that’s just taking too long for them. Compound that problem on the fact that many other characters, which Glenn fans may still love, are suffering and likely to die, it’s understandable that a lot of fans are pretty much over it. For the rest of us, though, Negan provides the ultimate enemy for Rick and an epic conflict that dwarfs anything that’s yet happened on The Walking Dead. Both are master strategists, both are brutal, and we are expecting great things. Steven Yeun is certain to have a great career outside of The Walking Dead anyway. Just keep an eye out for him. Next Is Evil Morty Smarter Than Rick?